Experience a gentle start, an intelligent approach, and lasting results to a better body. The SmartSpine System is used as a tool to decompress and recalibrate the entire spine. It stimulates the involuntary “resting” part of your nervous system called the “parasympathetic nervous system which supports your respiratory and digestive system. This induces a deeper relaxation response in your body. It is designed to unify the relationship of the head, neck, shoulders without compensatory neck and shoulder tension. Grounded in recent research in the field of fascia, the SmartSpine™ system aids in restoring mobility, and introducing the “feeling” of movement. This unique tool encourages embodiment through “learning to connect” using all the senses. The SmartSpine™ has now been embraced by the world of manual therapy and fascial work with a “whole body” approach to creating improved movement potential. The deeper effect and noticeable faster results are related to the application of warmth during treatment. Improves your body’s proprioreception which builds body awareness from the inside out, and improves your ability to better manage pain. Promotes and creates improved postural habits that reduce pain and increase mobility. 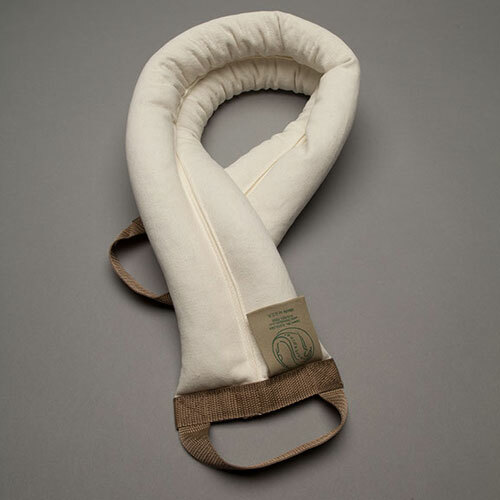 Improves optimal spinal height, and vertebral decompression. Relieves tension, fatigue and body aches. Creates deep abdominal awareness, while balancing the pelvis.